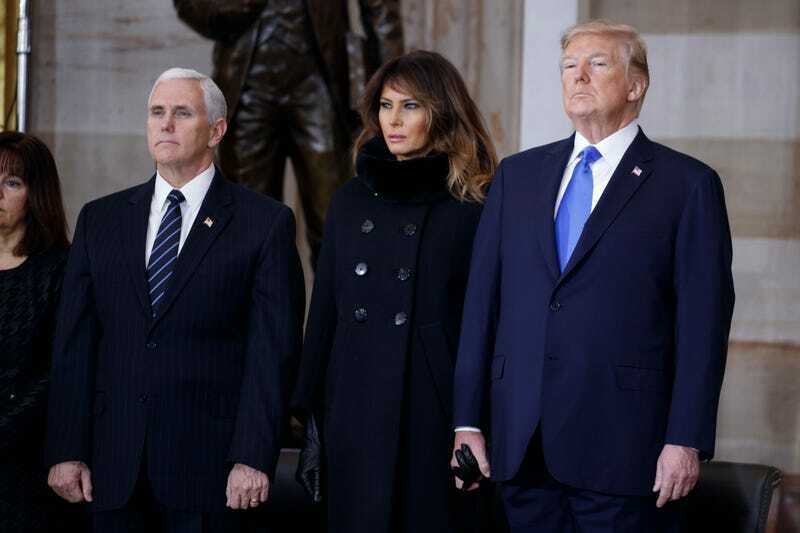 Vice President Mike Pence with a hand-holding first lady Melania Trump and President Donald Trump at ceremonies for the late evangelist Billy Graham at the U.S. Capitol, on Feb. 28, 2018, in Washington, D.C. I am trying to get confirmed proof that Melania Trump’s hand is actually inside her glove because, if so, it looks like for the first time since the president has taken office, he and the first lady are actually holding hands. I know what you are thinking: How do we know that this is actually Melania Trump and not a stand-in actress or hologram? And the truth is, we don’t. But several images appear to show someone claiming to be Melania Trump holding hands with a saggy bag of orange vomit that, on first glance, appears to be the soggy Depends-wearing president of WifeSwapping, W.Va., during ceremonies for the late Rev. Billy Graham as he lay in repose at the U.S. Capitol on Wednesday. Melania Trump could very well be holding a fake gloved hand inside her sleeve so as not to have to actually touch her husband’s dead flesh. Or someone inside the White House could have reminded her that based on the concubine contract she signed, she must make at least three public appearances in which she acts as if she knows the man she’s married to, and she figured that a service for the dead was as good an event as any. Or maybe Melania Trump would only agree to hold the president’s hand as long as her hand was gloved. According to the Weather Channel, it was 63 degrees in Washington, D.C., and clearly nice enough that the first lady could’ve let her fingers breathe a bit, but not at the expense of actually touching the old man’s hand; her husband is literally two years younger than her father!